The Village of Jonesville, once the County seat, was incorporated in 1855. The Hillsdale County Gazette, was begun in Jonesville in 1839. Beniah Jones, the first settler in Fayette Township, could hardly have imagined what would become of his village when he and his son build the first log cabin there, on the west bank of the St. Joseph River. Early Jonesville boasted large woolen and cotton mills. 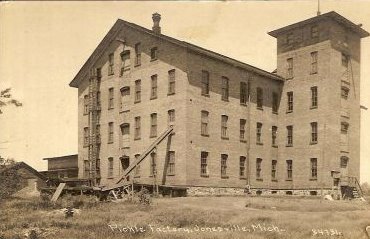 The Jonesville Woolen Mills, on West (a.k.a. Water) Street, north of Chicago Road, burned on January 3, 1866. In a little over six months the operation was rebuilt. Berton E. Poor, with his B.E.P. brand was one a number of cigar manufacturers in Jonesville and Hillsdale. The Pickle Factory was once considered "one of the greatest pickle industries in the county." 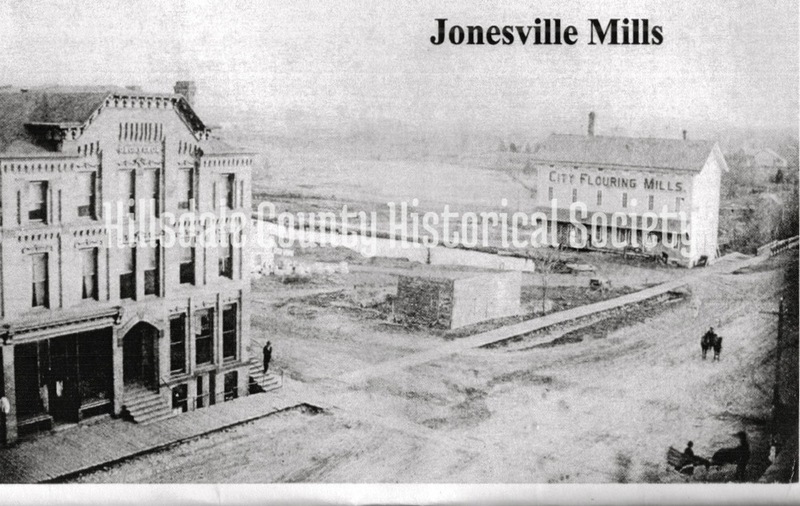 The Jonesville Fire Department building (which doubled as the Town Hall for a number of years), the three-story meat market (later hardware store) and printing office, with the old Woolen Mill in the background, were at the northwest corner of West and Chicago streets. The Grosvenor House Hotel, not be be confused with the home of E.O. Grosvenor, which was on Maumee Street.